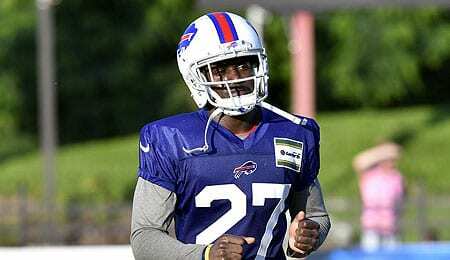 Can the Buffalo Bills Snap Playoff Drought? October 25, 2017 | by RotoRob | Comments Comments Off on Can the Buffalo Bills Snap Playoff Drought? The Buffalo Bills have gone 17 years since their last playoff appearance, the longest active drought in the NFL, and the longest streak in franchise history. However, with their win Sunday in the dying seconds over Tampa Bay, the Bills have moved to 4-2, tied for second place in the AFC East, and currently holding down the first wild card slot based on a better divisional record than Miami. Those of you involved in NFL betting for the season that wagered on Buffalo have to be feeling pretty good right now considering how long the odds were for this team making the playoffs heading into 2017. On Sunday, rookie cornerback Tre’Davious White — the team’s first rounder this year — played the hero, forcing and then recovering a fumble to set up the game-winning field goal with 14 ticks left on the clock. It was his first career forced fumble, and a damned memorable one at that. This was a great development for White, after he had looked shaky at times earlier this season (see video below). And if Buffalo goes on to make the playoffs, it could be viewed as a turning point in the team’s season. New Head Coach Sean McDermott came in with a plan, and the team seems to be buying in, creating a ton of excitement in the land of chemical blazes. Still, regardless of the plan, the players are getting it done on the field, making key plays, and that’s helped turn what many expected to be a rebuilding year into a season that could result in a playoff spot. Signing free agent placekicker Stephen Hauschka has proved to be a great move so far. After matching his career-high with 33 field goals last year, he’s already booted 14 this season — good for eighth in the NFL, despite the fact the Bills have already had their bye week. Heading into the season, Hauschka was not considered a starting worthy placekicker in standard sized Fantasy leagues, but he’s worked his way into becoming a top 10 option now. Considering the Bills’ offense remains suspect, having a dude they can count on to make field goals is huge. As good as Buffalo’s D has looked, it still needs some offensive support to keep putting up Ws. Given the position the Bills are in, their game this weekend — hosting the Raiders — takes on greater significance than you would have thought heading into the season. Oakland was a playoff team last year, but has struggled to a 3-4 mark early on. However, the return of Derek Carr puts them back on track, so the outcome of this game could be a huge piece of the playoff picture down the line. We’ll find out more about how real Buffalo’s start is after this game. Now it’s your turn. Let us know in the comments below how you think Buffalo’s season will unfold. Posted in FOOTBALL, RotoRob, Team report | Comments Off on Can the Buffalo Bills Snap Playoff Drought?